For RCL readings / Transfiguration click here. For Roman Catholic congregations, stay on this page. Naaman’s healing; he wished it needed something special but really it was very simple. TiS 414 / CH616 / UMH192 / VU582 / A&M265 / HPP134 / PH433 / GC550 / CP(E) 198 / Cha257 There's a Spirit in the Air (Wren) A good song of getting the business of following Christ done. Speaking out, caring for others, being changed. A joyful tune (it looks less so in TiS, but think of it in 6/8 instead of 6/4). Just think how brave Naaman's servant girl must have been. Seven verses – you might want to have women sing a verse and men sing another to keep people going. The TiS suggestion to use INVERCARRY is (in my opinion) not necessary; it’s easier to the set tune. Lyrics and tune sample. *MV157 I am a child of God (Harding) A simple song with powerful words. Very easy to learn. I would just sing the first verse this week, as a round. It's important to remember that God speaks through children. Good for kids. 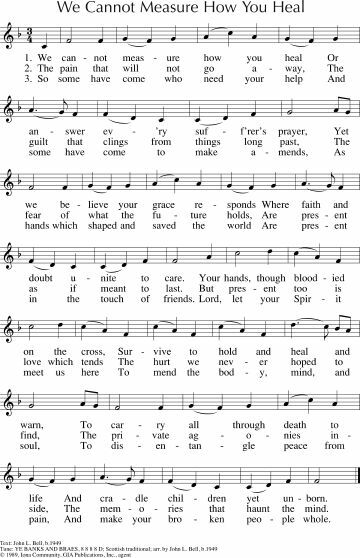 AHB 167 Your arm O Lord in days of old (Plumptre) A much older style of hymn, but would still be fine to sing "to hands that work and eyes that see give wisdom's heavenly lore, that whole and sick, and weak and strong may praise you evermore." PH181 / GtG805 Come Sing to God O Living Saints (Anderson / ELLACOMBE) Good, simple, inclusive, humble and realistic words based specifically on this Psalm. Sung to a well known hymn tune (I sing the mighty power of God). Many congregations choose to sing only the first and last verses; the middle two are much more challenging. Lyrics for 1st & last verse (search for “come sing”). *TiS 647 / AoV2-012 / ATN 25 Comfort, comfort all my people (Mann) Easy to sing, beautiful lyrics. Chorus is “Comfort, comfort all my people, with the comfort of my word. Speak ye tender to my people, all your sins are taken away”. Lyrics, mp3 sample. ATE 253 He turned my mourning into dancing This is not at all inclusive, but if you change the lyrics to make it addressed to God “You turned my morning into dancing”, it’s much much better. 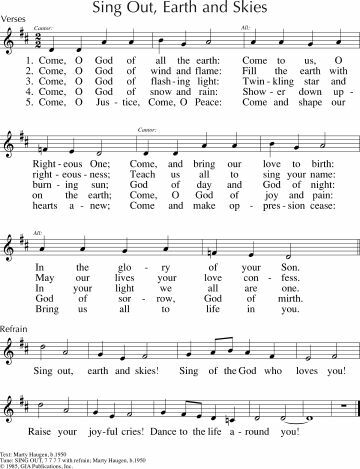 *TiS 181 / AoV2-032 / GC(II)497 / G(3)577 / CP589 Come O God of all the earth / Sing Out Earth and Skies (Haugen) A very joyful song for cantor and congregation, or small group and congregation; this is a big favourite in our church. Sheet music, lyrics and sound sample. *CH683 / VU420 / A&M491 / GC(II)469 / G(3)546 / GtG295 / CP598 / W&R553 / SP156 / URW132 / Lau426 Go to the world Go into all the earth (Dunstan) Great words of sending out. Can be sung to a couple of different tunes. SINE NOMINE is the easiest and best known. Sound sample. Sheet music sample. NCH433 / CH727 / UMH707 / VU703 / HPP474 / GtG250 / W&R515 / Cha638 In the bulb there is a flower (Sleeth) A simple song of hope symbolised in nature. Particularly good for those churches in colder Northern Hemisphere who have a while to go before Spring. Lyrics. VU166 / SFFS 2210 Joy Comes with the Dawn (Light) Lovely words. The verses are very straightforward; it might be helpful to teach the chorus because there's a couple fof jumps. Lyric slide show! *AoVK-125 / ATW 489 Turn our sadness upside down (Leigh Newton) Good for kids, and adults too. Simple tune, but not so simple that it’s boring. Lyrics (search in the page for "sadness"). Good for kids. URW255 You have turned our sadness into a joyful song (Eslinger) A simple and joyful refrain with a read Psalm. PfAS030B I will praise you O Lord (Bell) A lovely simple Psalm response - this one will work well sung as a response to the Psalm, or sung on its own where appropriate in the service. Works in Spanish too, and is Good for kids. PfAS030C All with joyful expectation (Morgan) Good celebratory words of resurrection and hope of new life. The tune YISRAEL V'ORAITA is very similar to LEONI, but has a significant change in the last line. Be aware! *PfAS030D Though weeping and deepest sorrow (Monteiro) The chorus is super-cool, with a driving rhythm (and a part for a triangle!). The verses will be best sung by a soloist, I think. *Tune In: A grain of wheat (Sheree Anderson) Unless a grain of wheat falls to the ground and dies, it won't form roots and grow. A boppy song with deeply meaningful lyrics. Reference recording, lyrics and songbook. Good for kids. *AoV2-033 / VU647 Travel on travel on (Sydney Carter). I think this old folk song would work well to pick up the theme of "pressing on". Lyrics and chords here. Worldmaking.net O Author of Faith yet at work in our hearts (Bruxvoort-Colligan) New words to an old tune “O Jesus our Christ, lead the way for our faith to give perseverance for running the race. You’ve gone on ahead for to stake out a claim. We trust in the journey and look for your footsteps. O Jesus our Christ, lead the way for our faith!” Lyrics and sound sample here. *TiS 666 / AoV2-113 / AoVK-126 / ATOK 409 / NCH526 / Iona (Common Ground, Freedom is Coming) / CH516 / VU646/647 / WoV650 / ELW866 / A&M483 / SFFS 2235 / HPP153 / GtG853 / G(II)357 / GC513 / GC(II)516 / G(3)594 / Cha442 / SP235 / Srce737 We are marching in the light of God / Siyahamba / Caminando (South African) A very popular chorus, with possible alternate verses, depending on your source. Sometimes people get anxious about the word "marching", but remember that this song comes from apartheid-era South Africa, where people were protesting so that they could vote in their own country. And the marching is toi-toing, much less militaristic than what you may imagine. Good for kids. 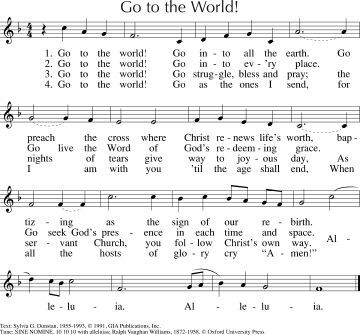 UMH438 / VU416 / A&M476 / CP467 / CP(E) 430 / W&R718 / Lau861 Forth in thy name O Lord I go (Wesley) A nice old minstrelly tune, and timeless words about committing all our works to God. I'm listing a lot of old hymns this week! Lyrics. *TiS 607 / AoV2-126 / ATN 95 / CH528 / VU684 / StJ / A&M725 / SFFS 2171 / HPP406 / GtG753 / G(II)524 / GC726 / GC(II)721 / G(3)828 / CP(E)519/ W&R587 / Srce 462 / Lau898 Make me a channel of your peace (Temple). Lovely. Nice if you can just start a capella... Youtube video of Sinead O'Connor singing it and lyrics and MIDI file. *NCH437 We shall not give up the fight (South African) A great song for congregations standing with those in a struggle for freedom. Be sure to put the song in historical context so it doesn't seem to militaristic. That should be all of our congregations really. I like the version by this choir in France! Good for kids. *Iona (Love From Below / common ground) / CH718 / VU613 / A&M522 / GtG797 / G(II)401 / GC575 / GC(II)558 / G(3)657 / CP292 / CP(E) 348 / W&R628 / SP140 / URW146 / Lau433 We Cannot Measure How You Heal (Bell) Really very excellent words to a very familiar celtic air. Easy to sing; be careful not to get too fast; it's tempting but the words need a slower tune. Sheet music sample. Sound sample. *Tune In Come O God and visit us sick we pray / Your abundant life (Brown) A joyful song "Lead us into your abundant life". This has been sung frequently by the musicians at BUC, but not by the congregation! Lyrics and sound sample. *Seeds of Faith Jesus’ hands are Healing Hands (Bruxvoort-Colligan). A simple and fun kid’s song. "Jesus hands are healing hands, full of love and grace”. Lyrics, sound sample and songbook available here. Good for little kids. *TiS 670 / SiS569 / AoVK-138 / ATE 258 / CH692 / Srce385 Jesus put this song into our hearts (Kendrick) A fun Yiddish tune that gets even more fun if you get faster and faster as you go. Try teaching your congregation a simple side to side “dance” step. If you teach them and make it clear that it’s okay, you’ll be surprised how many people dance to God. Good for kids. Lyrics. ATAR618 Just like Jesus (Mann) A fun song for kids, pointing out the things Jesus did that were not really very acceptable, like touching a leper. Verse 4 will need to either be explained or omitted - the song works just fine without it. Good for kids. Thanks Natalie -- I'd just finished picking all my music based on Transfiguration when I got an email from the Priest saying he wants to use these readings. I appreciate being able to come here to get some ideas.